Wimberley, Texas--The Blanco River runs through quiet, scenic Wimberley. Locals say famous muralist and artist Buck Winn was the first to set up his studio here in the 1940s. It wasn’t long before others followed, drawn by the slower pace of life and pastoral setting. Now, artists, sculptors, candle-and-jewelry-makers abound. In just one block of West Spoke Hill Drive, for instance, I found furniture craftsman Gary Weeks, glassblower extraordinaire Tim de Jong and metal sculptor Perry Barnard. Gary and his family and group of craftsmen turn out their specialty: hand-tooled rocking chairs. If you call ahead, Gary will guide you through the process of turning pieces of raw mesquite (or other woods) into a rocker, which fetches up to $3,700. It would seem to be true. A stone’s throw away (but please don’t, there’s glass!) is Wimberley Glass Works. Tim de Jong moved here in the early 90s, started blowing glass and now has several full-time artists doing the same. Spectatory are encouraged to watch the entire process sitting in bleachers that seem like church pews. There’s no admission and they don’t even pass the plate, though you can buy a beautiful plate, platter, vase or lamp in the gallery. Next door, you’ll probably hear Perry Barnard before you see him. Perry’s metal art shop is where he pounds out metal sculptures from recycled materials. He’ll take an old oil drum lit or an exhaust pipe and weld them into faces or animals, whatever his imagination and the materials dictate. Perry loves Wimberley, but he’s aware that the very things that appeal to him will bring others, too. Real estate developers have “discovered” it and Austin is breathing down residents’ necks. But for now, Perry’s fine with it all. And artists are still moving here as well. 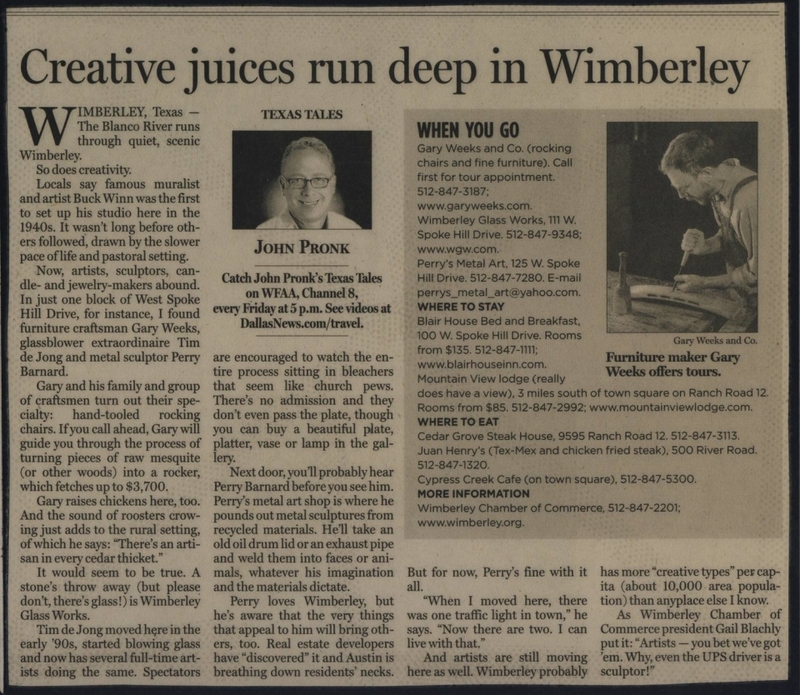 Wimberley probably has more “creative types” per capita (about 10,000 area population) than anyplace else I know.